Landowner Thomas Coke Hammond was born in Charlestown, Indiana, in 1826. His father was Methodist minister Rezin Hammond (1788-1871), who first migrated from Frederick County, Maryland, to Clark County, Indiana, in about 1820. The elder Hammond then purchased 400 acres of land in Washington Township of Marion County. Rezin Hammond is listed in several history books as the first minister to preach a religious service in the newly established City of Indianapolis, which occurred at an outdoor gathering near the White River in 1821. Thomas Hammond married Martha Anna Richmond on January 25, 1870. 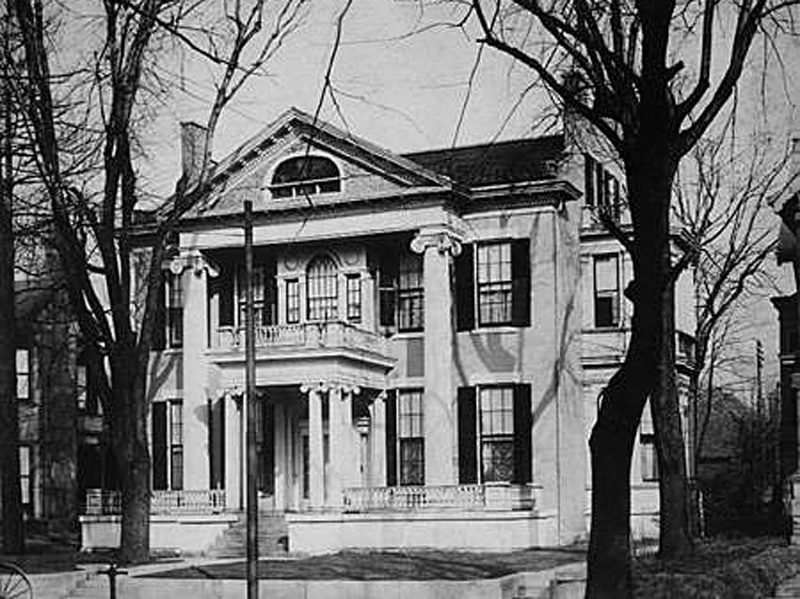 Some time after his father’s death in 1871, Thomas either inherited or purchased 246 acres of land that was previously owned by Reverend Rezin Hammond. 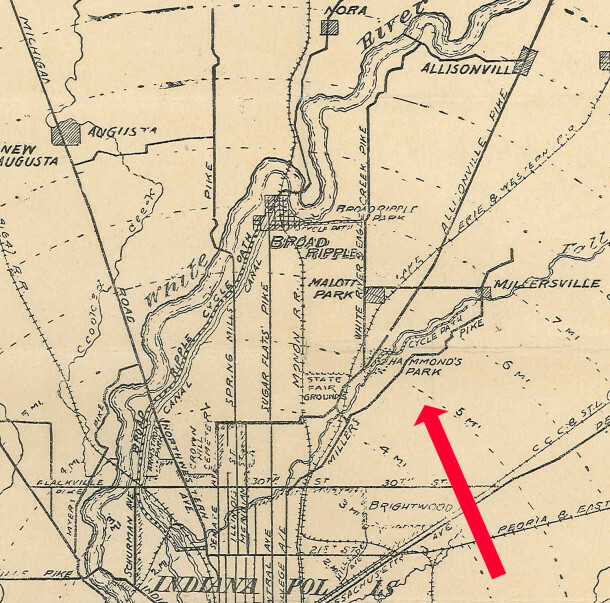 At that time, the official boundaries of the City of Indianapolis were still entirely within Center Township and did not extend as far north as Washington Township, so it’s difficult to find many documents to confirm the exact details. 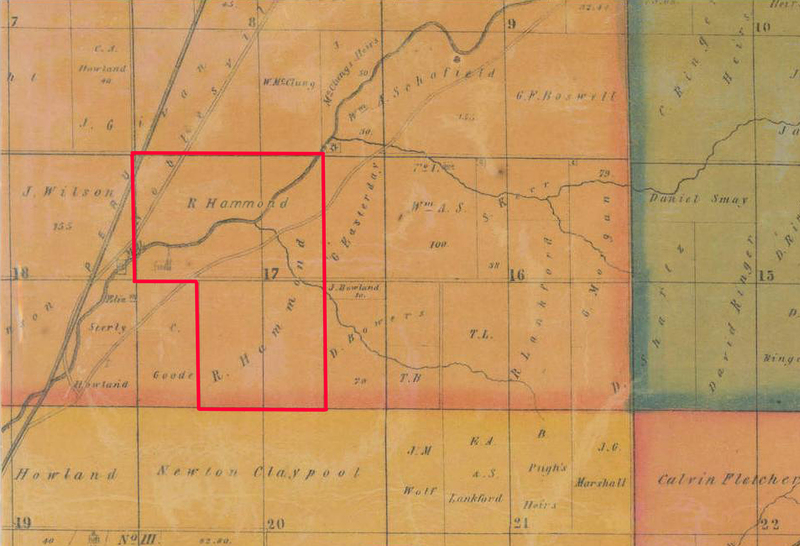 Thomas Hammonds’ land was roughly bounded by 40th Street on the south, 46th Street on the north, Keystone Avenue on the west and Sherman Drive on the east. 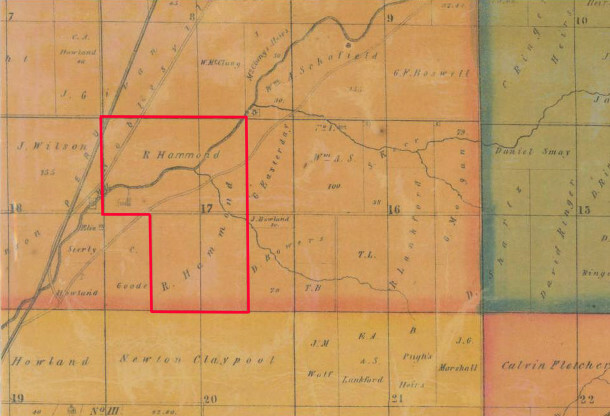 Fall Creek flowed diagonally through the Hammond acreage from the southwest to the northeast. The Millersville Gravel Road ran more-or-less parallel to the east bank of the creek’s path. The town of Millersville was about a mile northeast of the edge of the Hammonds’ land. 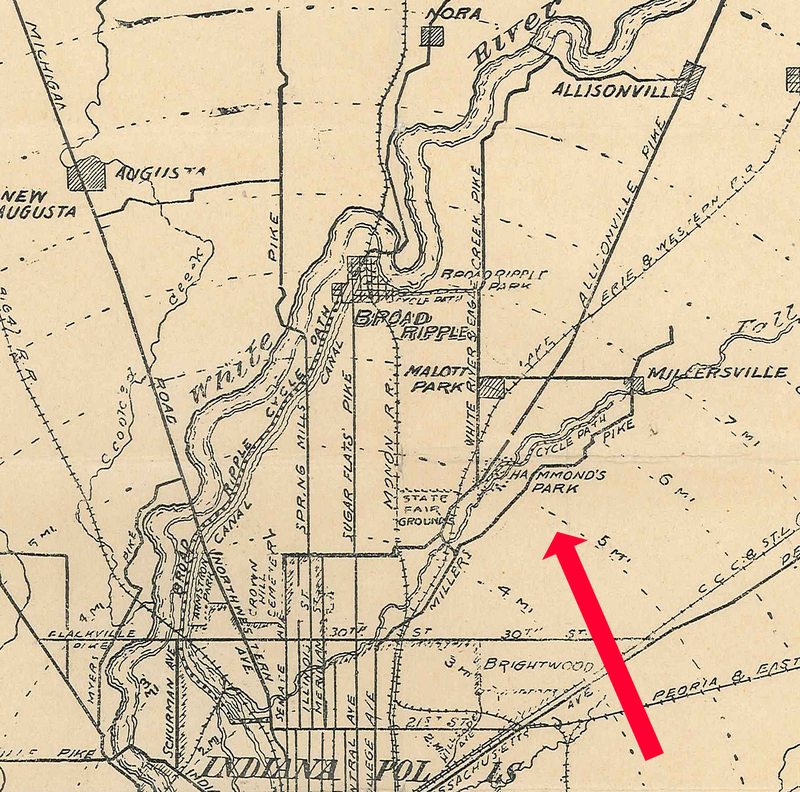 On Oct 27, 1899, contracts were awarded by the City of Indianapolis to construct a bridge over Fall Creek that would make the Millersville Gravel Road more accessible. The toll road passed right through Thomas Hammond’s property as it made its way northeast to the town of Millersville. 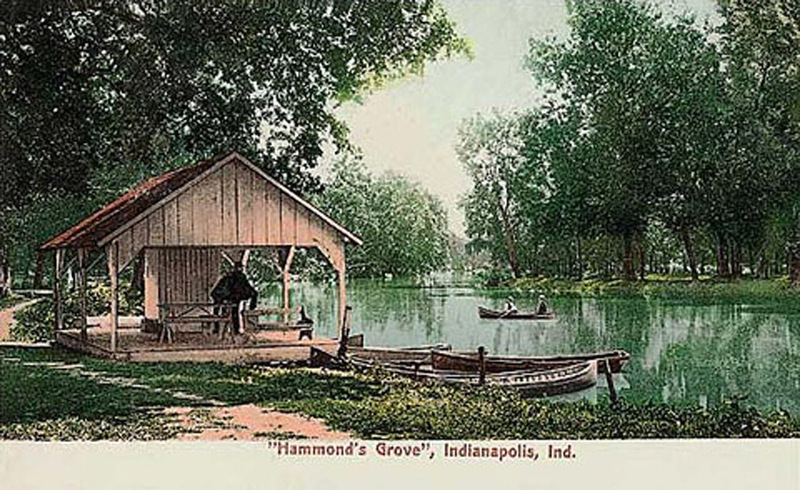 Hammond’s Grove became a popular destination for city folks to get out into the country, without having to travel very far from town. 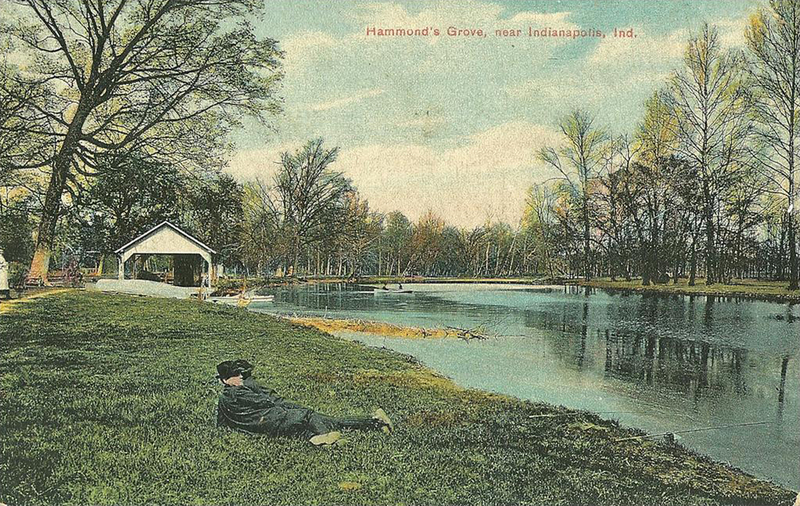 Other recreational places also existed on the White River in the same time period — like Fairview Park (now the campus of Butler University), Huffman’s Grove (now the Warfleigh neighborhood), and Ravenswood (still known as Ravenswood), but those locations were all farther away from downtown. Hammond’s Grove was just beyond the city limits, which at that time was Maple Road (later also known as 38th Street). In Indianapolis City Directories prior to 1913, Hammond’s Park is listed as being on the northeast corner of Baltimore Avenue and Fall Creek, which is on the southeast side of Fall Creek. 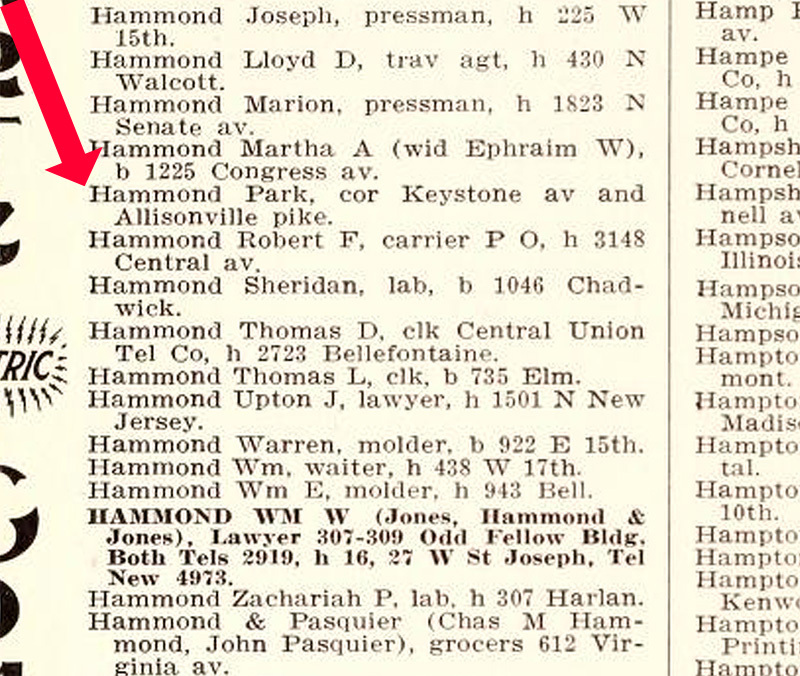 Indianapolis City Directories after 1912 list Hammond’s Park as being on the northeast corner of Keystone Avenue and Allisonville Pike, which is on the northwest side of Fall Creek. These locations are on opposite sides of the creek, which is confusing. Either the descriptions were not precise or the location of the park may have changed over the years. The last of the Hammond family’s residences is still standing at 4221 Millersville Road. The original Thomas Hammond homestead burned at some point. It was reportedly a large, two-and-a-half-story structure. 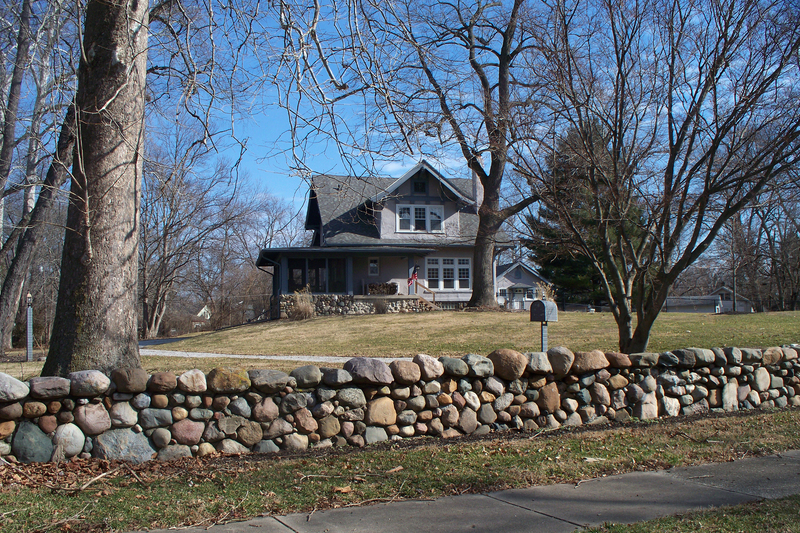 After the fire, the Hammonds built a smaller home on the same foundation as the original home. That home is directly across the street from the former location of Roberts Dairy at 4201 Millersville Road. William H. Roberts started a dairy and home delivery service in 1877. Generations of the Roberts family operated the business for more than a century before it closed its doors in 1987. 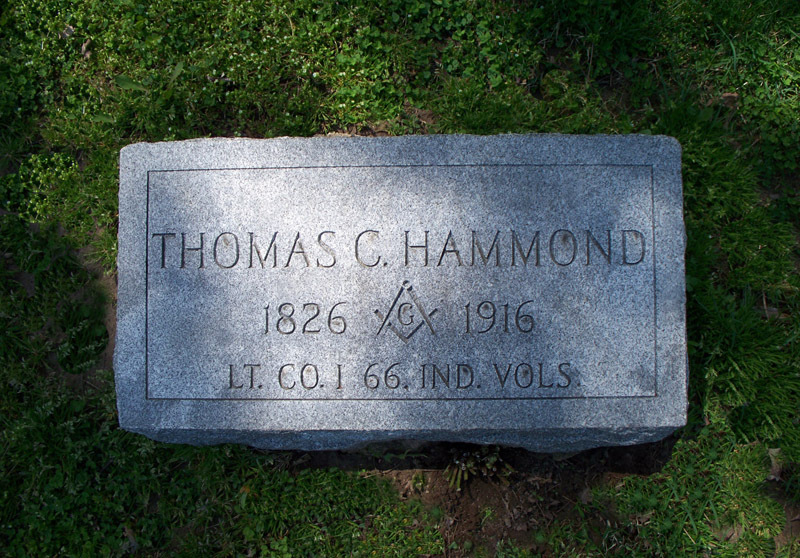 Thomas Hammond, his wife, his sons, and their wives are buried in the Fall Creek Union Cemetery at 4110 Millersville Road. According to a historical marker erected on the grounds, the cemetery was established in 1836 by the Ebenezer Lutheran Church, which occupied this spot until 1986. The names and dates of interments in the churchyard can be viewed here. 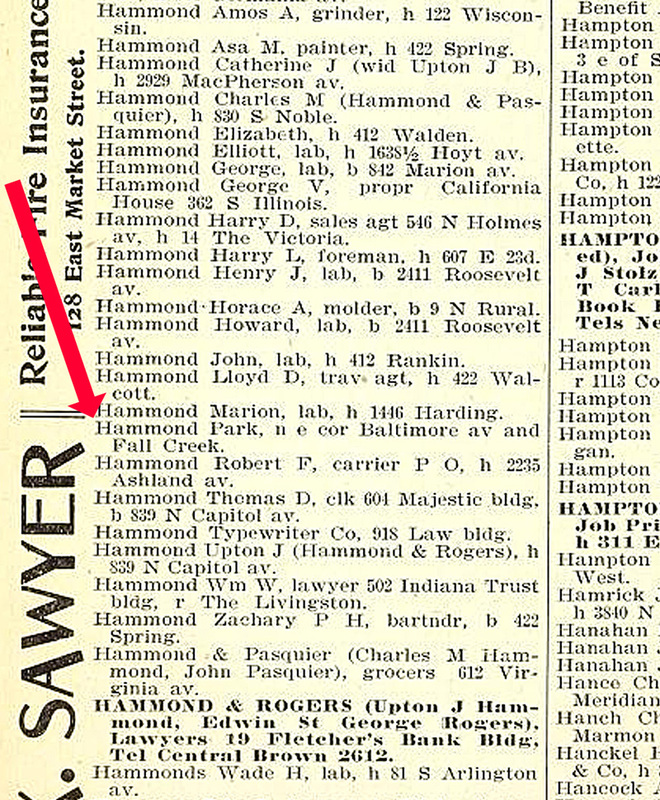 About five years after the death of Thomas C. Hammond, his son Thomas D. Hammond ran a newspaper ad to sell Hammond’s Park. It would appear that a portion of the former Hammond’s Grove became the Town & Country Shopping Center. 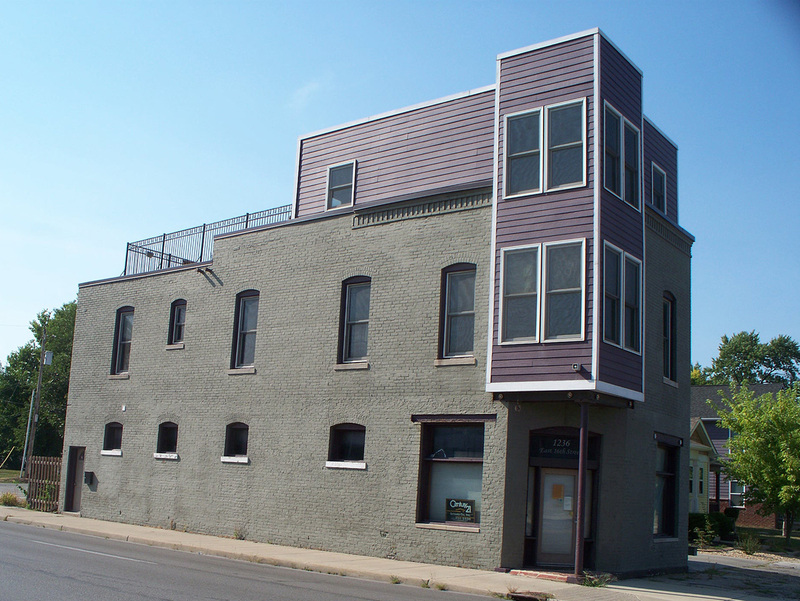 Other portions of that tract of land became apartments and office buildings. Although no park as large as the former Hammond’s Grove remains in that vicinity today, there is the IndyParks Fall Creek Trail that parallels the waterway. Part of the Greenways system, the Fall Creek Trail runs from Skiles Test Nature Park on the north to the Monon Trail on the south, a distance of just under 7 miles. Some of the trail was likely part of the Hammond family’s land at one time. Would love to see a write-up on the Sutherland family (who used to have farmed north of the State Fair Grounds at what is now Herron-Morton)…there’s a cemetery near Hammonds’ named Sutherland Cemetery along Millersville Road as well…thanks for this article, Sharon! Sutherland Park Cemetery is right next to Fall Creek Union Cemetery. Although they appear to be the same cemetery, they are not. Sutherland Park is privately operated, and Fall Creek Union is managed by the church in front of it. The church that originally established its congregation on this site was Ebenezer Lutheran, and the burials were mostly church members. Here’s a link to a map of the area: http://binged.it/17fzG7J. Thank you, Sharon! This dates me, but I can vaguely remember Roberts Dairy with cattle grazing along Millersville Road. I can also remember where the Meadows Apartments were built being cornfield, and one could look downhill and see the pasture there…damn! For years the Moravians from Second Moravian at 34th and Hovey St, and Haverford Moravian at 54th and Haverford met at Sutherland Park on Easter Morning at Sunrise for the brass band sunrise Easter Morning Liturgy. Both Churches are now closed, though the buildings remain used by other congregations. I can’t remember ever having a question answered more thoroughly! Thank you! Thank you for sending in the question, and thank you for your research since the piece was posted. I hope we’ll get it figured out some day. I will have to share with my mother. During WWII, she and my grandmother lived on Millersville Road next door to the Roberts family (sharing a party telephone line) while my grandfather was fighting in Europe. Perhaps she may have some memories of the Hammonds’s and the Park. I’m sure people would enjoy hearing any memories your mother may have of this area. I know I would. I’ve been learning more and more each day about the interesting families that settled in the vicinity of 42nd and Millersville Road. Good job, Sharon. How’s the housecleaning and clearing going? 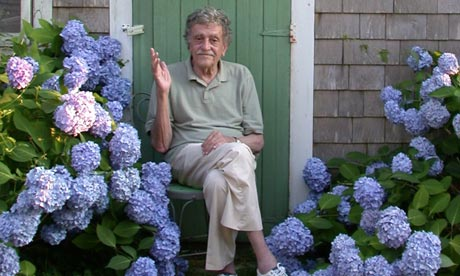 I grew up on Ashbourne Lane, one of the “Devon” subdivisions built over Hammond’s holdings. Spent many an hour goofing off near the creek. The post card views look like the west bank, just south of 46th St. Robert’s Dairy delivered to our house. Sharon, something doesn’t add up. I had done a little research re this location a few years ago and wasn’t satisfied with what I found. Baltimore Avenue was (is?) west of Keystone Avenue while the Hammond property was east of Keystone. 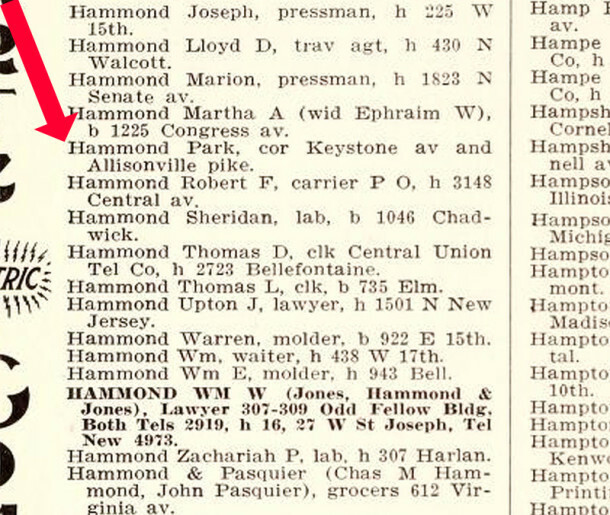 That description in the older city directories suggests “Hammond’s Grove” wasn’t even on the Hammond property. Plus, that intersection with Millersville Gravel Road was as much as a quarter mile from Fall Creek. If we are to take the city directories literally, it must have been a large park. 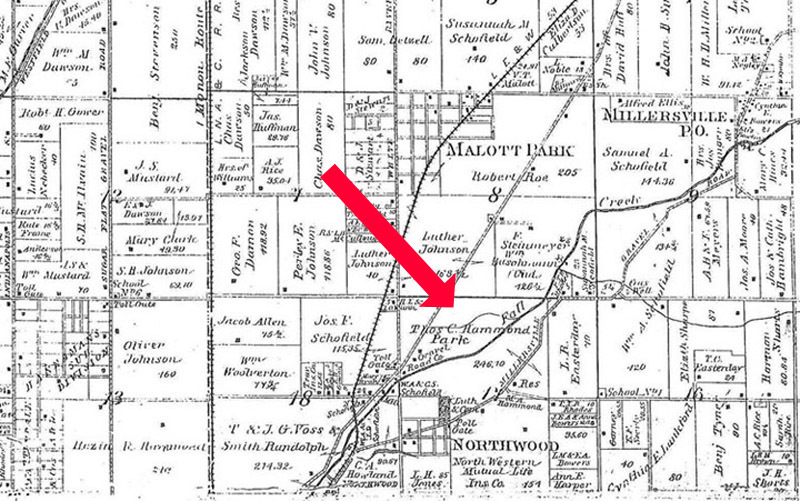 There is also that “Park” notation on the 1889 plat map you included in the article. There was plenty of space to place that note south of Fall Creek, but it’s placed north of the creek. 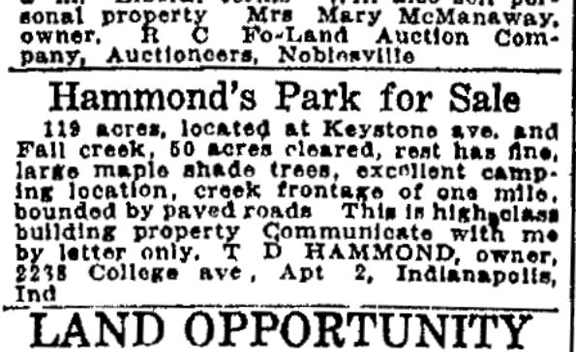 They jury is still out, but I’m inclined to believe that “Hammond’s Grove” was always located near the Keystone/Allisonville intersection. My Dad purchased property at 4221 Millersville Road; there is a stone in the back yard. We are trying to find out if the face is that of Thomas Coke Hammond (1826-1916), or that of his father Rezin Hammond (1788-1871). Any suggestions on where we can look further? Any new developments? I noticed the house was for sale again? What came of the stone?